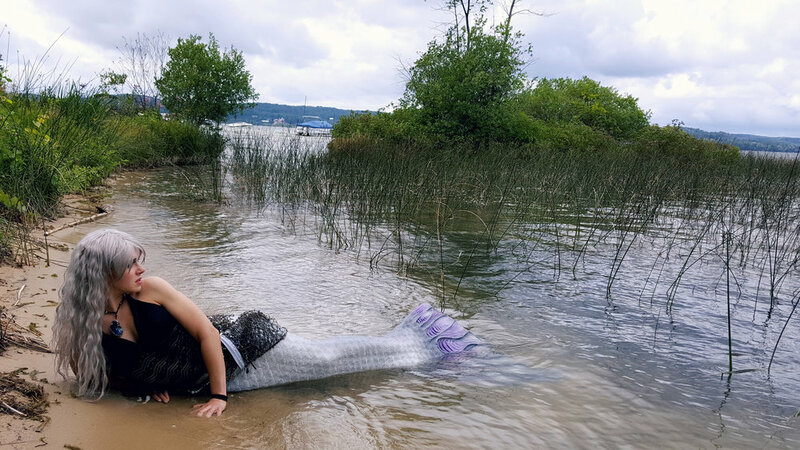 If you went around telling people that "mermaids are real" and you've seen one swimming in your local lake, then you'd probably get some pretty weird looks... luckily, if you live around Grand Traverse Bay, then there is plenty of proof that you aren't crazy... at least not for claiming to having seen a real live mermaid! This summer, I have gone for countless swims in Lake Michigan with my MerNation silicone mermaid tail (whose name is "Sparda," and who really needs another bath right about now!). Although not all of my ventures out into the waters have turned out to be what you'd call "magical," (those videos are coming soon! Hehehe!) many of them have been truly memorable experiences and have helped to distract me from the turmoil that has recently unfolded regarding health and relationships. Whoever invented mermaiding... THANK YOU SO MUCH! For me, being a mermaid isn't just about splashing around in the water. It's not a game of make-believe. To me, the rhythmic motion of the dolphin-kick swimming technique is meditative, it soothes the soul. Hovering above the rocks and the sand at the bottom of the lake is so quiet and so peaceful. There are no thoughts of calories. There are no anxieties about the future. There are no thoughts of broken relationships or about the time lost dwelling on such things. Time stops below the water's surface. Nothing exists but the moment at hand. It's a beautiful thing. Mermaiding has been a real life-saver this year. It really has. However, mermaiding isn't just something I do for myself. While I find it to be therapeutic, it's about more than just me. Being a mermaid is about being someone's dream-come-true. It's about being the manifestation of the wish that a child (no matter their age) hoped would become a reality as they tossed a penny into a wishing-well ages ago. And when unsuspecting individuals spot a fairy tale creature, something that couldn't possibly exist, basking in the sun on their way home from work, it is my hope that I can provide them a break in their day from the hustle and bustle of the real world. As a mermaid, it is my duty to provide others with a bit of magic in their lives... even if the illusion only lasts for a brief glance. Mermaids may not be "real," but the thought that a person can become a "mermaid," professionally even, can perhaps give others hope that anything really is possible. Being a mermaid is about helping others to dream again. It is about opening their eyes to the endless possibilities that are within their grasp in this world. I don't swim simply for my own pleasure. Well now... this post did not end up being what I intended it to become. I thought I'd open up my computer and type up a short-and-sweet post about how I went swimming one sunny July day... and it was fun. Then I'd share my latest tail-swimming video with you. As it turns out, I don't swim for the fun of it. I'm not a mermaid for the pleasure of looking pretty and having people fawn over me. I do what I do because it brings me piece of mind. It is my solace in the madness of life. It is my way of making the world a better place. Honestly... I've never really thought about it like that until just now... funny how sometimes your fingers seem to know more than your brain! Since we're on the topic of purpose and meaning (kinda), I would like it if you could do something for me before you "X" out of this blog post. Could you please think of some of the things that you typically like to do (you can even write a list down on paper!) and then think about why it is that you do each thing. Maybe it makes you smile? Maybe you think it will make mom proud? Maybe it's to avoid dealing with a stressful situation? Can you detect any patterns in the reasons behind why you do what you do? I know this is a weird transition from mermaiding (and honestly not what I expected to be writing about either! ), but I think getting to know and understand yourself better is one of the most important things that you can do to grow as an individual and to ultimately contribute more to this world.